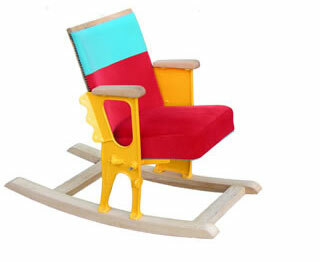 A quirky design and eco-friendly too – the Rocky rocking chair. The work of Derbyshire-based designer Guy Arzi, it uses old seating from flea pit cinemas (mainly dating back to the 50s), the wood and metal restored to its original state. But that’s not all – new, brightly coloured fabrics are used for the upholstery, while locally-sourced wood is added for the rocker base. All of which combines to produce something both old and new, but certainly distinctive and unique. Not cheap though, each one retails for £1,499.99.